PRIVACY at its finest!! 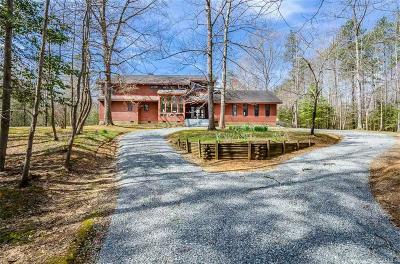 This contemporary home is tucked up amongst the deer and turkeys on this 14 acre wooded parcel!! This property features a freshly graveled entrance that will carry you past the pond on the left then up to this 3 bedroom, 2 bath home! The home features large open rooms including a Great Room with vaulted ceilings and a stone, wood burning fireplace and doors that lead out to a rear deck! There is an open Kitchen with white cabinets, Island and a walk through Pantry with a chest freezer!! There is a 2 car attached garage with a door that brings you right to the utility room! There are 2 bedrooms on the first floor along with a Full Bath! Upstairs enjoy a huge Master Suite with a stone wood burning fireplace, private bath with a huge tub and shower!! This home is perfect for the outdoorsman or the person who likes peace and quite! The 14 plus acres is made up of 2 parcels, Lot 12 & 13, there is possible you can build another home on the other lot, check with the County! This property is conveniently located only 15 minutes to I-64 or I-295! Directions: Rt 106 To Rt.604 (N. Warriner Road) Go Around First 90 Degree Turn To Left Then Go Tosecond 90 Degree Turn And Drive Straight Into Driveway.